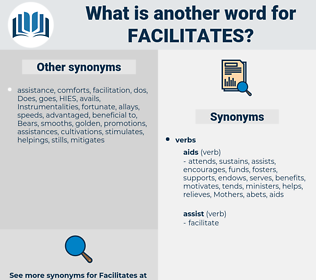 What is another word for facilitates? 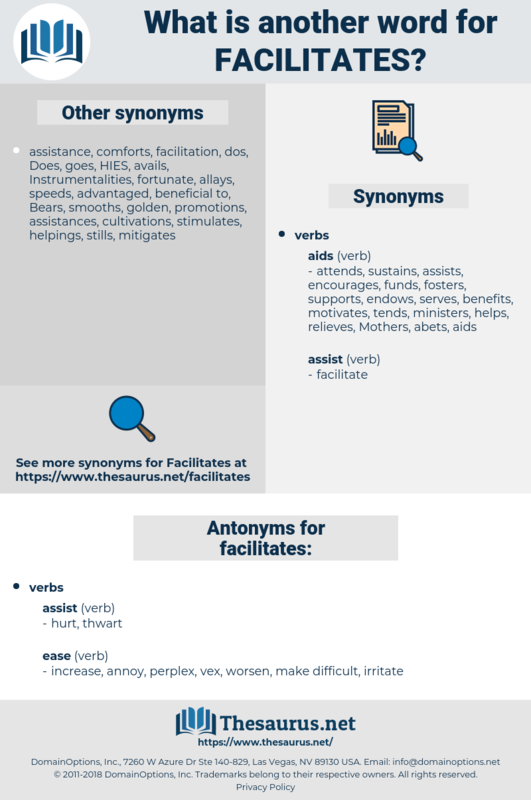 Facilities, facilitators, favours, benefits, sites, fosters, purposes, locations, Permits, supports, places, leads, Incentives, advances, offers, fuels, Addresses, Opportunities, champions, simplifies, venues, lets, Masks, Drives, promotes, makes, stimulates, streamlines, encourages, allows, enhances. stimulated, accelerates, alleviates, cultivates, eliminates, contributes, integrates, accommodates, coordinates, Co-ordinates, participates, expedites, creates, cooperates, exacerbates, regulates, generates, assisted, translates, reinforces, anticipates, stipulates, empowers, invites, improves, prefers, strengthens, potentiates, identifies, exists, furthers, advocates, animates, assists, induces, establishes, demonstrates, prevents, sustains, ensures, informs, hastens, aims, foments, entitles, aid, minimizes, reduces, broadens, connects, renders, involves, oversees, contains, inspires, favors, organises, emphasizes, achieves, introduces, Grants, organizes, arranges, underpins, guides, describes, increases, nurtures, advance, assesses, boosts, expands, PAVES, combines, yields, authorises, spurs, assures, secures, feeds, serves, prepares, expects, tells, Facilities, reveals, engages, support, supporting, presents, prompts, key, Keys, develops, clears, opens, qualifies, saves, responds, Leaves, highlights, arises, determines, asserts, is, affords, alleges, Carries, extends, tends, produces, submits, claims, performs, builds, stresses, favours, succeeds, upholds, conducts, seeks, maintains, Comes, convenes, benefits, takes, recommends, contends, embraces, works, depends, agrees, breeds, urges, Gives, expresses, adds, sets, endorses, raises, foresees, fosters, for, believes, hosts, argues, envisages, Plays, pursues, pushes, supplies, draws, Permits, meets, Focuses, Backs, puts, supports, shows, places, pays, leads, holds, keeps, Strikes, offers, runs, Addresses, simplifies, gets, lets, Masks, Does, Drives, promotes, makes, stimulates, streamlines, encourages, allows, enhances, conducive. increase, annoy, perplex, vex, worsen, make difficult, irritate. halt, disallow, prevent, oppose, inhibit. check, block, detain, hinder, prohibit, stop, delay. frustrate, curtail, protest, obstruct, impede. facility, fusillade, fizzle out, foucault, faculty, fasciolidae, faecalith, face cloth, facilitated, fecalith.